It's never too early to start thinking about spring, or even summer! You never know when a hot sunny day will sneak up on you especially if you live in California! It happens more often than you think! Whether I am out running errands, doing some shopping, or going to a picnic, a romper and a kimono are definitely my go-tos! The best part is that they are both very versatile and can easily transform my look from day to night! Here I am rocking a stunning sheer striped lace kimono paired with a checkered romper and straw panama hat from. 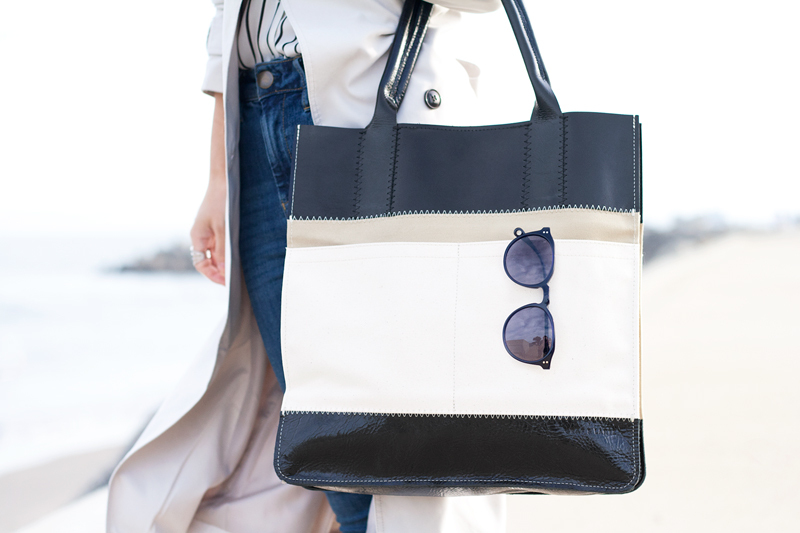 Lastly, I gave the black and white look a pop of color with a yellow satchel and ballet flats! Checkered romper c/o Charlotte Russe. 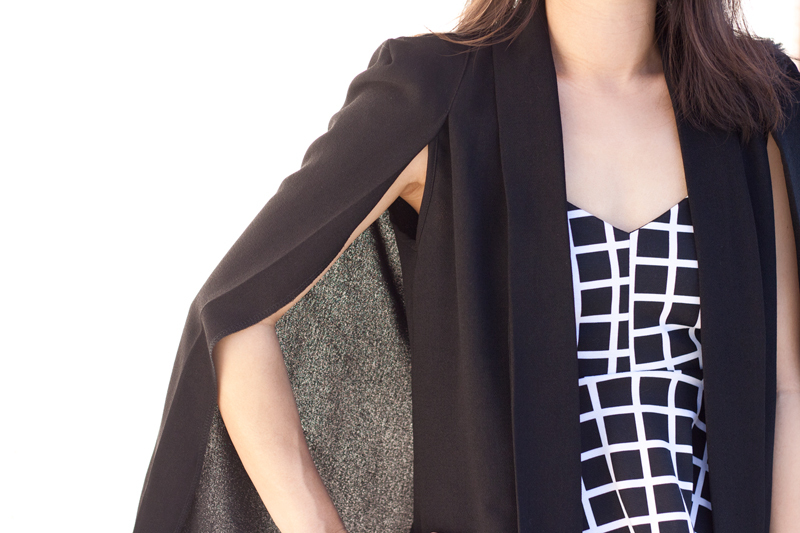 Striped mesh and lace kimono c/o Charlotte Russe. Straw panama hat c/o Charlotte Russe. 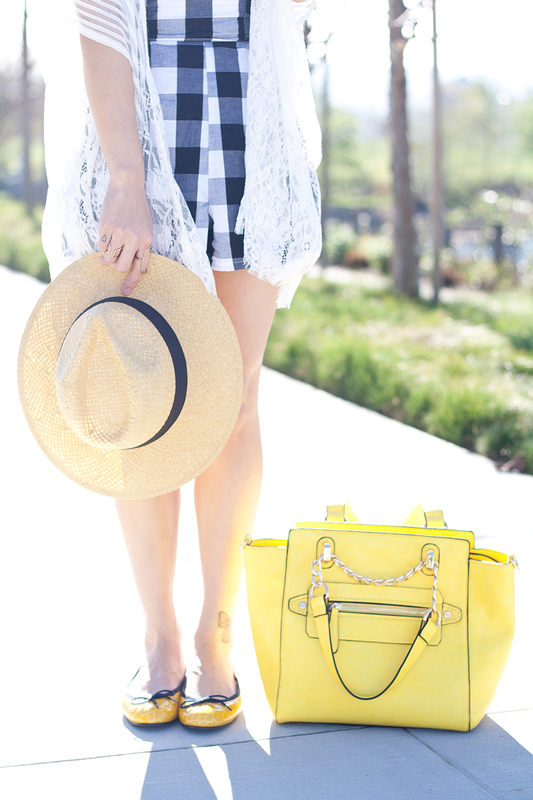 Yellow convertible satchel c/o Charming Charlie. Yellow croc leather ballet flats c/o London Sole. It's been a long time coming but I am finally down to my second to last post of my new apartment tour. A bit strange to call it new since I feel like I've moved into this place forever ago! Anyways, today I am showing you around my kitchen and dining area. 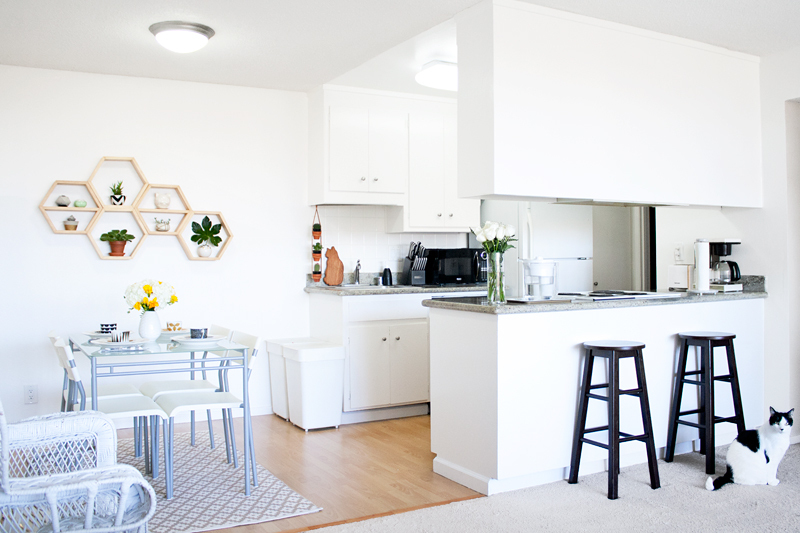 I love a bright kitchen (bright everything in general) and luckily my entire apartment is filled with natural light! 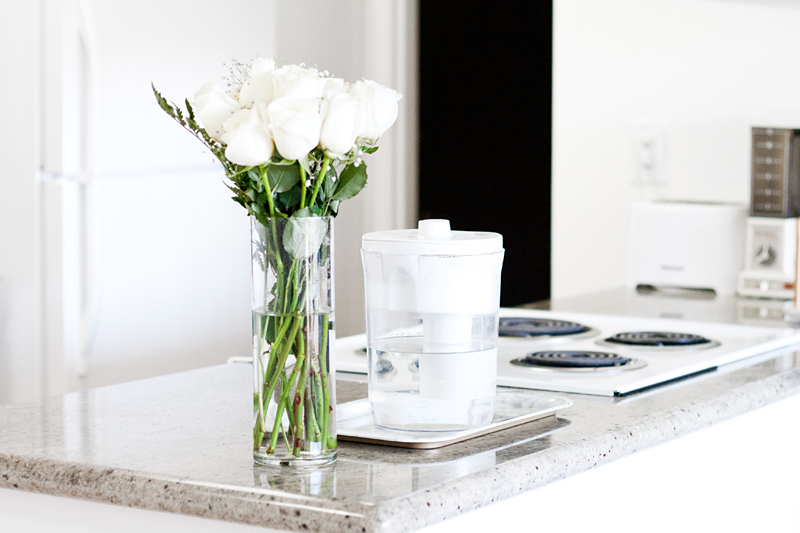 Someday when I own a house, I imagine my kitchen looking somewhat similar, all white but perhaps with white marble counter top and backsplash! One thing I do admit is that my kitchen is not usually this spotless, there are usually fruits and bread on the counter but of course those were removed for the shoot! 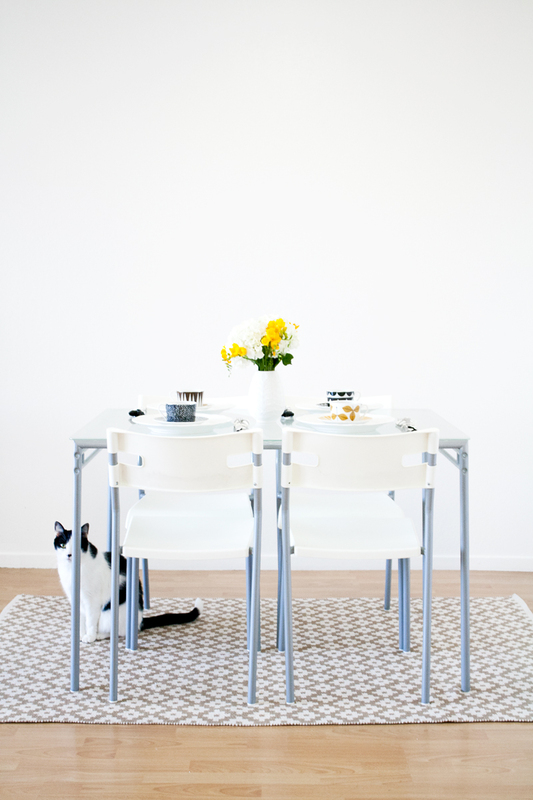 To refresh you memory, here are Part 1, Part 2, Part 3 and Part 4 of my apartment tour. Stick around because I saved the best (the closet/office) for last! Top: Concrete vase c/o 45wall. Mint and white planter c/o Luna Reece. Chevron planter c/o 3 Girls and a Kiln. Cat planter c/o Sue Sue Sue Crafts. Bottom: Gold concrete planter c/o Nimwit Studio. Ceramic planter c/o Gopi Shah Ceramics. 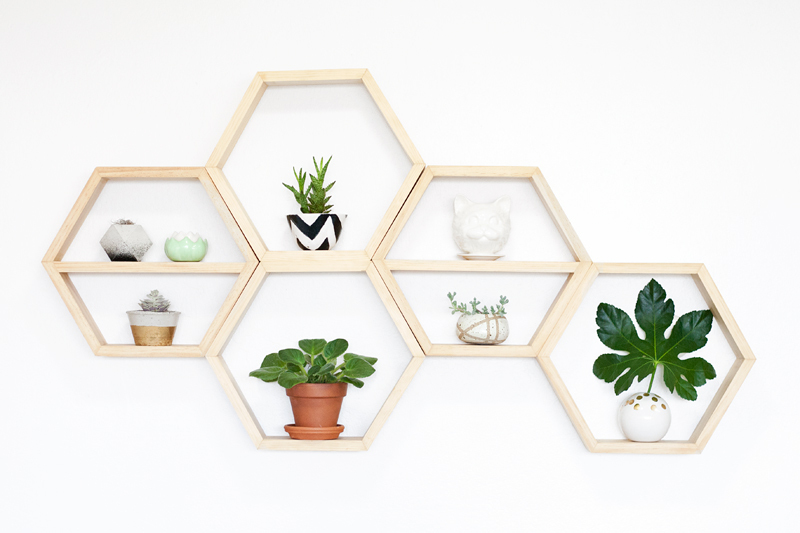 Gold dotted planter c/o The Object Enthusiast. Samode Khaki/ Ivory patterned rug c/o Dash & Albert. 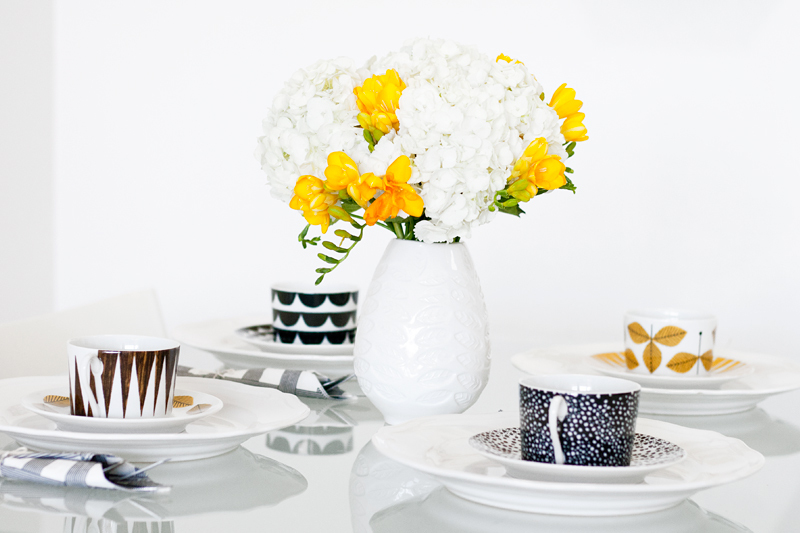 Top: Triangle Walks cup and Arbour Habour saucer, Tu Es La Vague cup and saucer, c/o House of Rym. 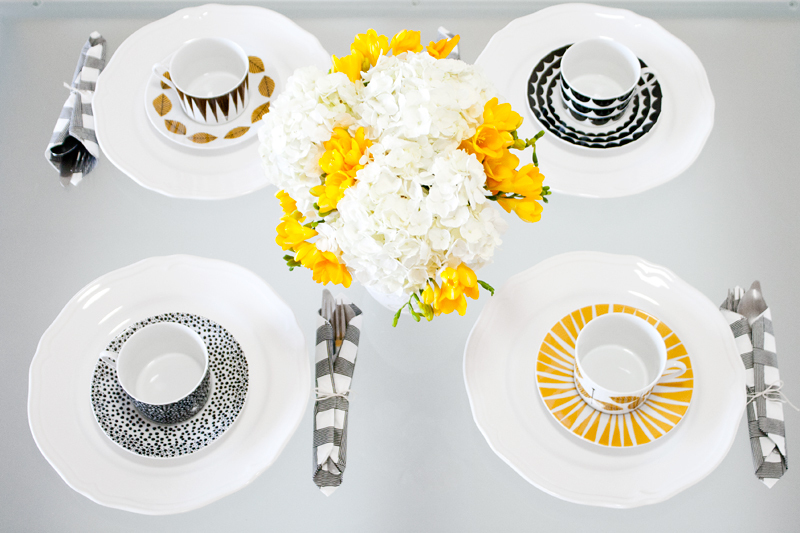 Bottom: Sprinkle Sprinkle Little Spot cup and saucer, Arbour Harbour cup and Stripes Never Wear Out saucer, c/o House of Rym. 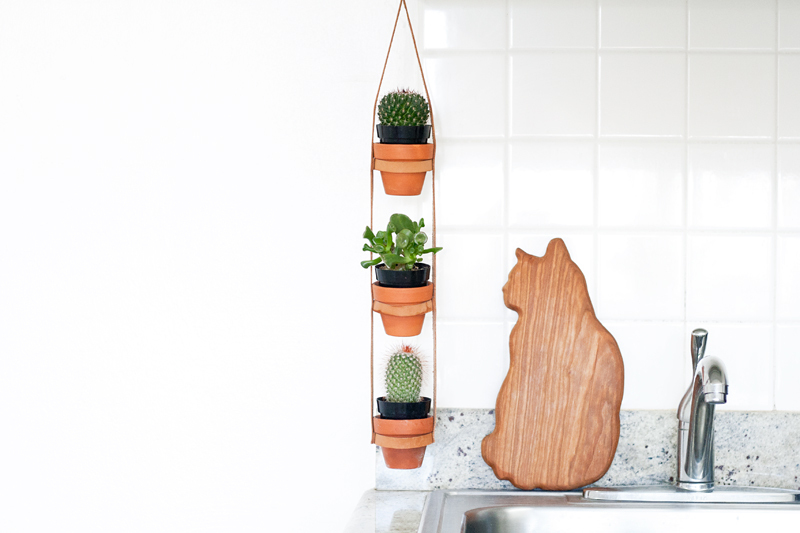 3-pot leather hanging planter c/o Rheemade. Cat shaped wooden cheeseboard c/o Bored with Splinters. 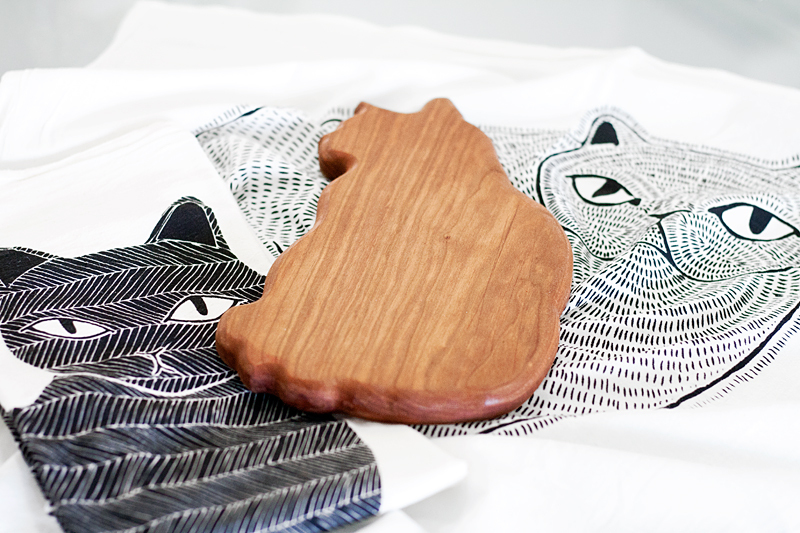 Black cat tea towel and Persian cat tea towel c/o Gingiber. Cat shaped wooden cheeseboard c/o Bored with Splinters. 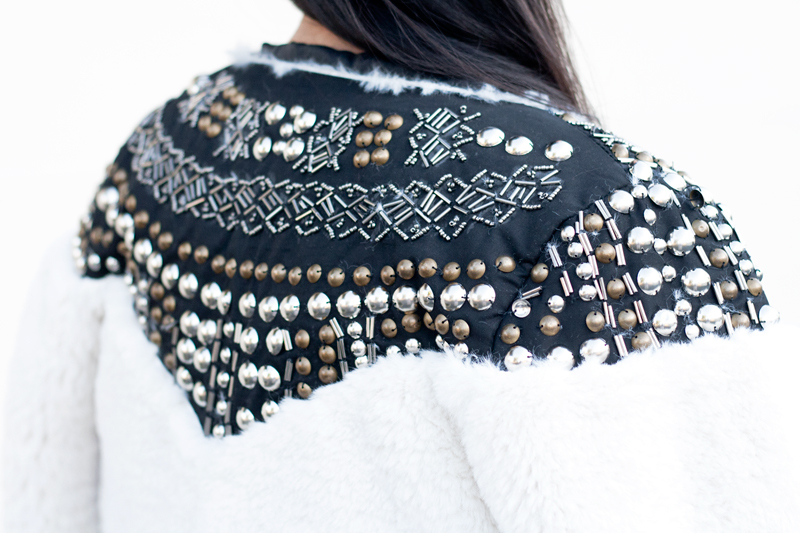 Studded and beaded fur jacket c/o Style Moi. Pleated chiffon top (available at Nordstrom) c/o Ro & De. 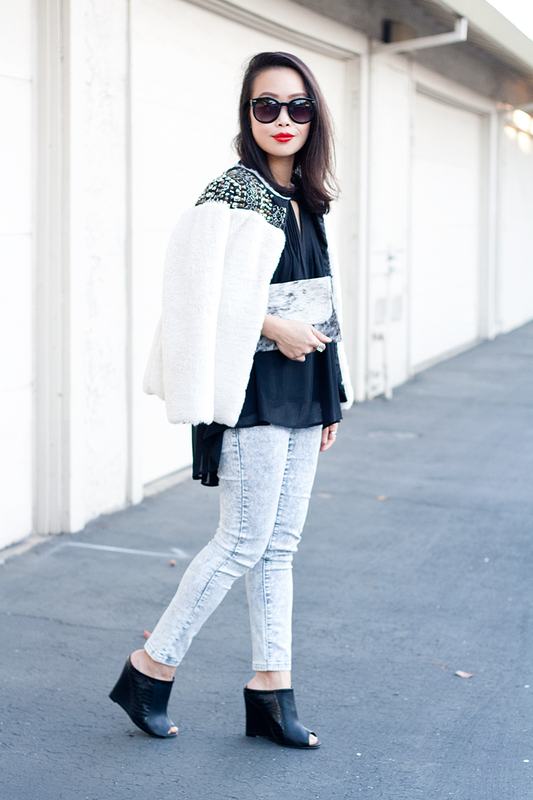 Acid wash jeans c/o F21. 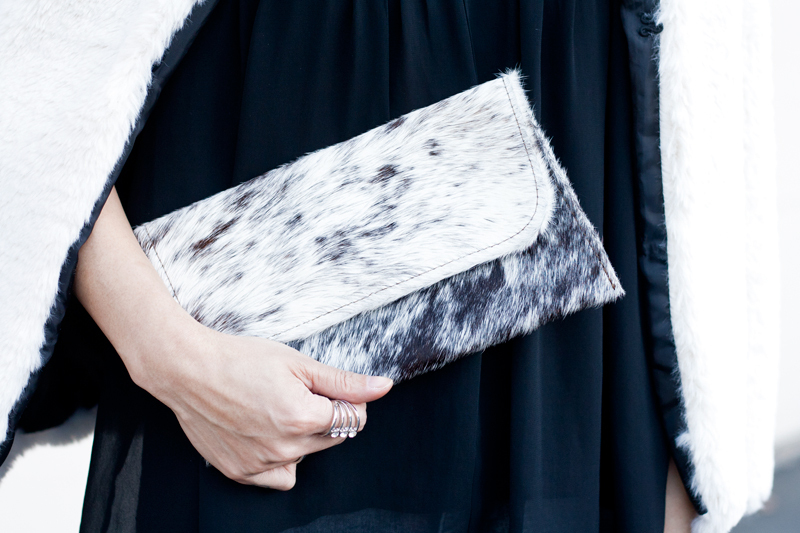 Cowhide clutch c/o Jackson and Hyde. These were taken last weekend when we spontaneously decided to head down to our old stomping ground, Santa Cruz, for the day. It was a relatively warm day so I slipped into a pair of high waisted blue jeans and airy chiffon blouse, but threw on my lightweight trench when the cool breeze started rolling in. Whenever I head out of town for the day, I always count on a trusty tote to carry all my things. I love that this one by Graf and Lantz is equally chic and practical. Another thing I always have with me is a pair of sunglasses. I bet you can't tell these ones I am wearing by RAEN is actually a deep cobalt blue color! The subtlety is what makes them so unique! 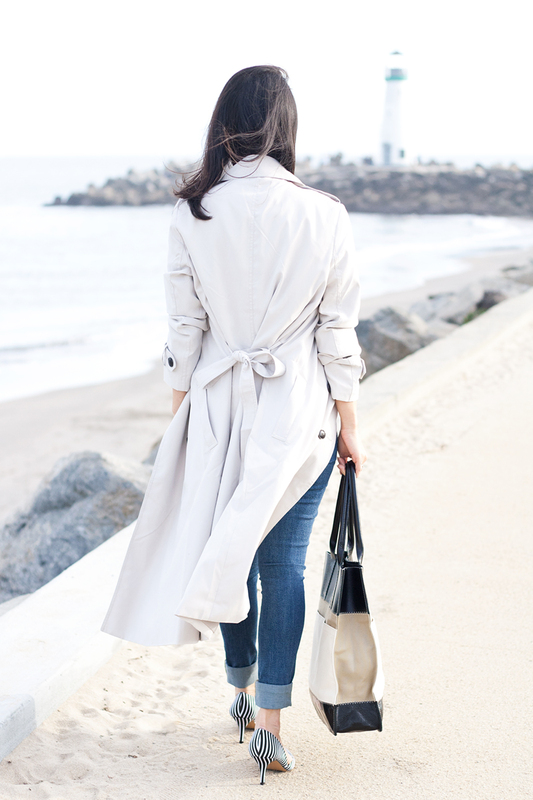 Belted trench coat c/o F21. 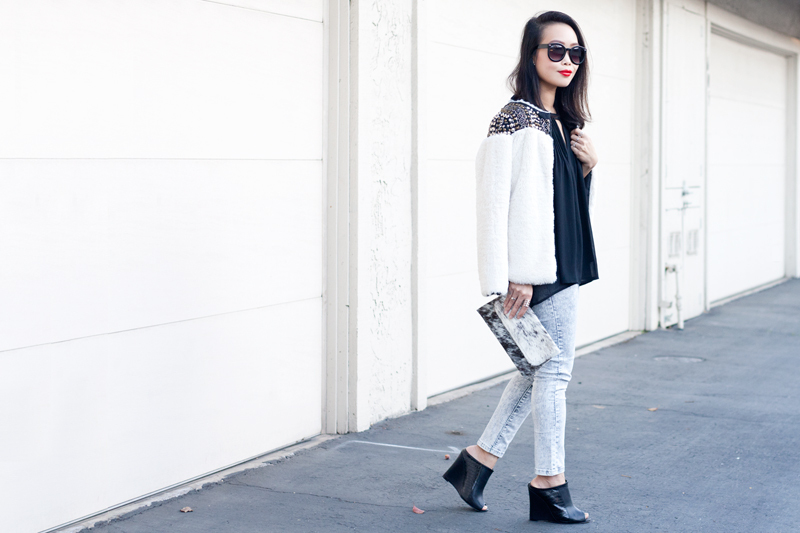 High waisted skinny jeans c/o F21. 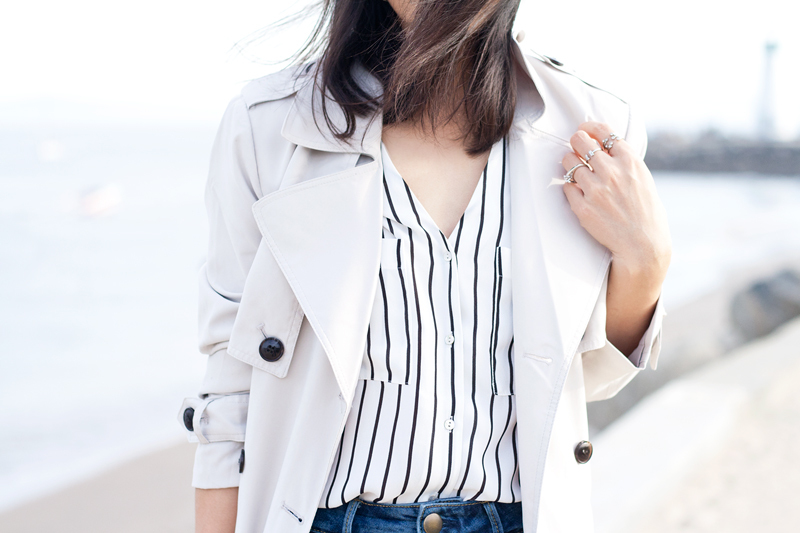 Striped chiffon blouse from H&M. 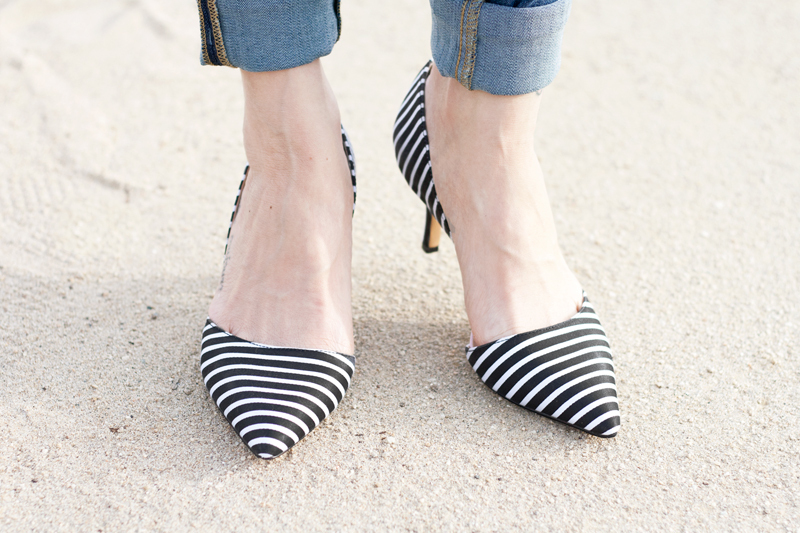 Jenn striped d'orsay pumps c/o Sole Society. 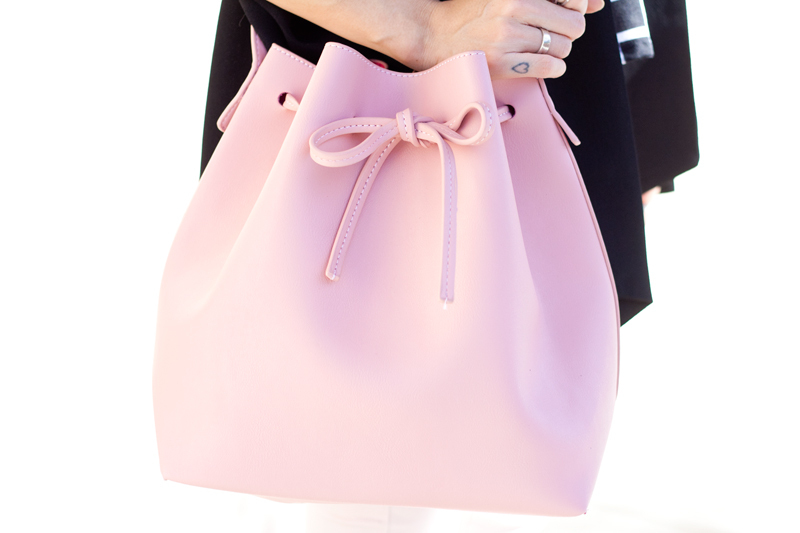 Ellis leather and canvas tote (soon to be released) c/o Graf & Lantz. Remmy sunglasses in cobalt by RAEN c/o Ditto. Stacked rhinestone ring from F21. Cut out rhinestone ring from F21. Rhinestone open front ring from F21. Silver band c/o LZZR Jewelry. Somewhere along the line I became quite fascinated with stripes. I wear it often these days, sometimes on its own and sometimes doubling up. We were blessed with some warm weather over the weekend so I paired up a striped crop top and these awesome striped culottes together. Speaking of culottes, that's my other obsession! They usually fit me more like pants though since I am short but I don't care. There is just something very chic and effortless about them, and in my opinion they are perfect for transitioning from winter to spring. I kept the look casual with flats and my new leather tote from J.Crew in collaboration with their #accessoryfix campaign. Simply Instagram how you style your J.Crew accessories with the hashtag #accessoryfix and #jcrewcontest for a chance to win one of three $1,500 shopping sprees! 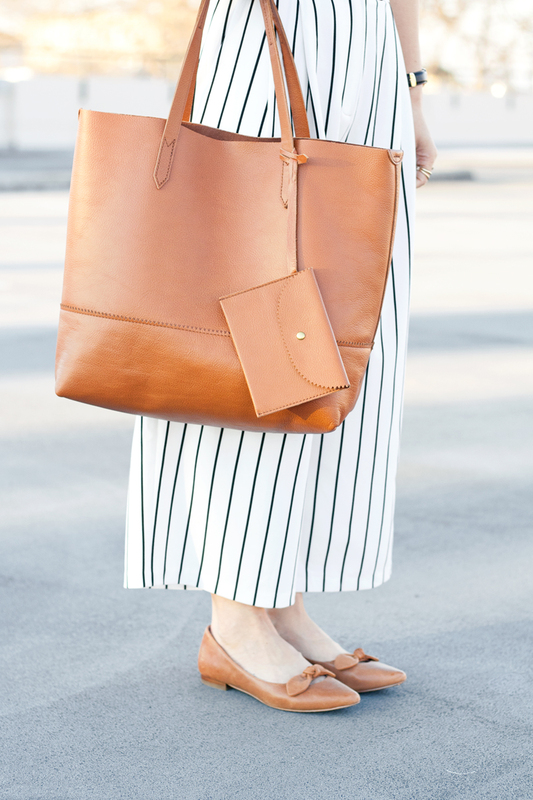 Downing leather tote in English Saddle c/o J.Crew. Hilary bow leather flats c/o Sole Society. Classic Sheffield Lady watch c/o Daniel Wellington. Shield Glam Knuckle ring c/o Boera. Valentine's Day might be over but the pink continues. What I can say... I love pink (obviously, I prefer blush pink over hot pink)! Most people associate the color pink with anything super feminine and romantic but it is more of a neutral to me. It is a shade I wear all year round, layered up in deeper muted pink for fall and winter and lighter brighter pink for spring and summer. 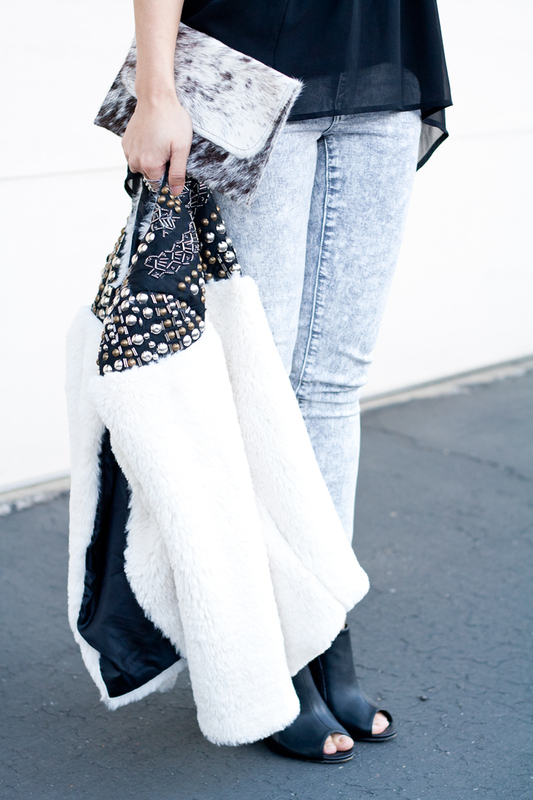 If you want to create an edgier look with a touch of girliness, just add some black to the mix, like today's outfit! I paired these blush pink high waisted denim with a black and white windowpane peplum tank and an awesome caped blazer (most awesome blazer ever)! Pink is more versatile than you think and it doesn't necessarily look over the top girly! 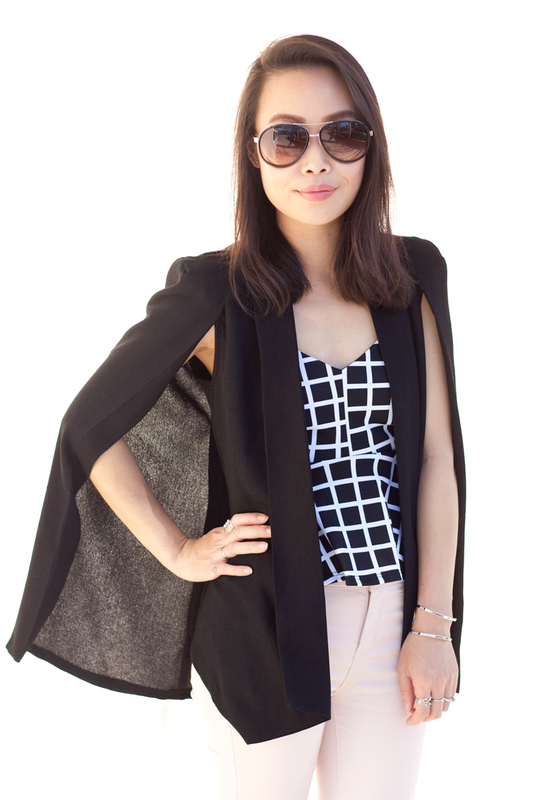 Structured cape blazer c/o Charlotte Russe. 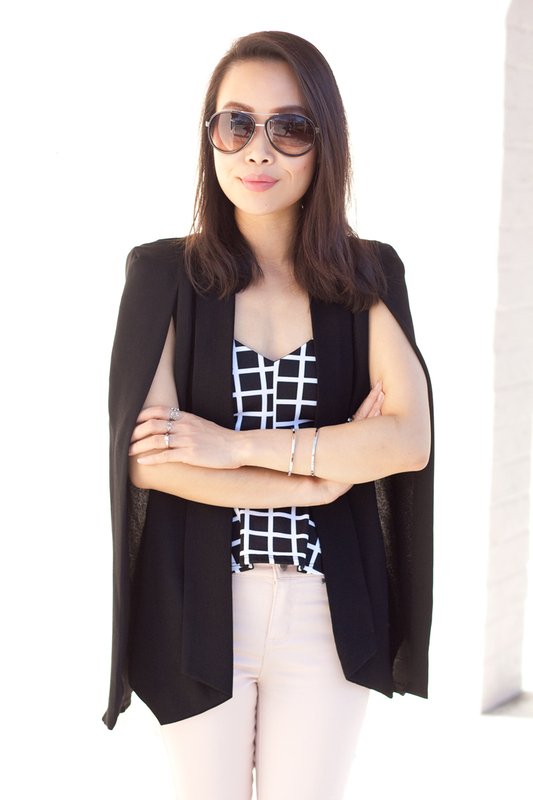 Windowpane peplum tank top c/o Charlotte Russe. Blush high waisted denim c/o Charlotte Russe.